So you say it's breakfast time? And you are in the mood for a little Mexican food? Or maybe just something along those lines? Well, look no further! Last month I had the pleasure of hosting Breakfast Club, an event created by Helen of Fuss Free Flavours . As the host, I was able to pick the theme, and since I'm almost ALWAYS craving them, you can bet that Mexican (& Mexican-inspired) breakfasts were my choice for the month. So to inspire you to head into the kitchen with a little south-of-the-border flair, I bring you all of the mouthwatering recipes submitted this month. 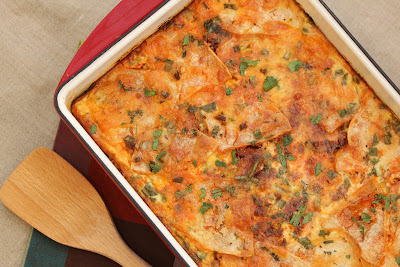 First up, Karen from Karen's Kitchen Stories combined tortillas, eggs, poblanos, chorizo, cheese and so much more to make this mouthwatering Mexican Breakfast Casserole. Seriously, just looking at it makes my mouth water. I'll be making it sooner rather than later. And then Jessica from Tejana Made decided to tickle a craving that I have had for at least two or three months with her absolutely amazing looking Machacado con Huevo. I should probably tell you that I made it the very next morning. And I couldn't be bothered to take pictures because I needed it my belly. Next time. Now we have two more of my favorite things to start the day with from Katie at Mexican Wildflower. She brought (my all-time fave) Chilaquiles and Huevos Divociados. I'm not sure what she's trying to do to me, but salsa-softened tortillas and eggs smothered in two types of salsa really gets me excited. Just sayin'. For my first submission this month, I decided to try yet another dish from a book that I currently can't get enough of. Roasted poblanos and mushrooms topped with a golden yolk and ooey-gooey cheese...oh yeah. 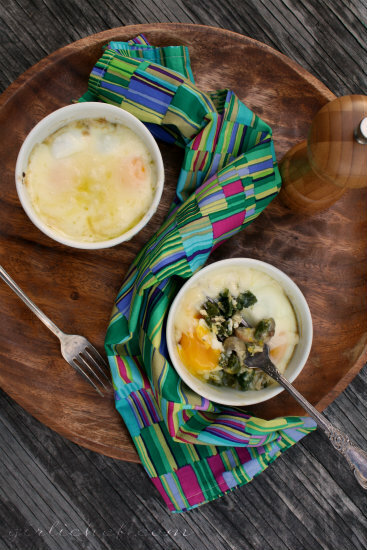 I (Heather from girlichef) just had to bring these Poblano & Mushroom Baked Eggs. It won't be my last time making them. So. Sunnyside up or scrambled? What's that you say...both!? Yeah, me too. 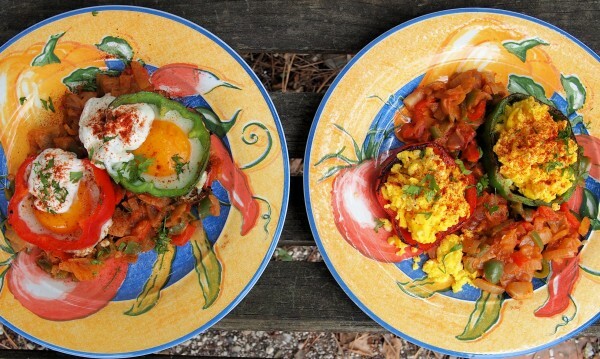 But no matter which version you choose, it's guaranteed to be tasty if you spice it up with a little Mexican flair and serve it inside of bright, beautiful pepper rings atop a bed of spiced onion like Karen from Lavender and Lovage did with her Mexican Breakfast Eggs - Two Ways! Does anyone else wish that they could wake up to a cast-iron skillet filled with golden chunks of potato and the seductive heat of hatch chiles? Come on, I know it's not just me. 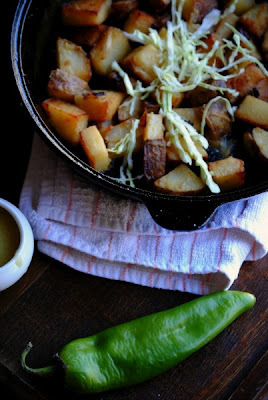 I know Vianney from Sweet Life would share her Hatch Chile Breakfast Potatoes if I asked nicely. And Vianney - one egg, over-easy and salsa, por favor! Sometimes, you wake up with a sweet tooth. Well, sometimes I wake up with a sweet tooth. 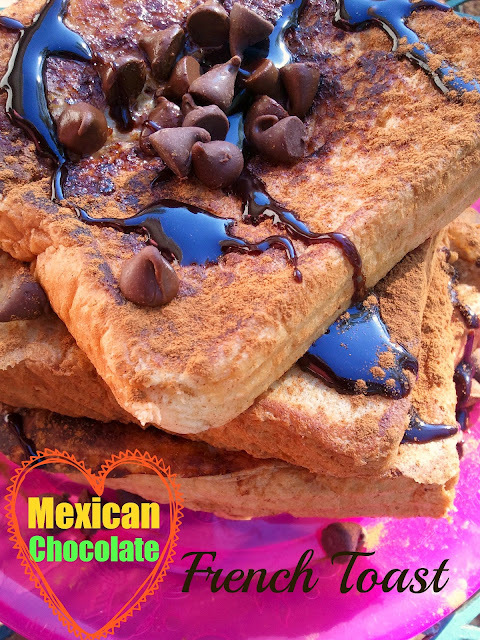 And I'm guessing that this delectable Mexican Chocolate French Toast from Chica Chocolatina would cradle that sweet tooth like a baby and make it feel loved. Who doesn't want to start their day with a little chocolate and cinnamon now and then? Katie from Mexican Wildflower is back (as if her other dishes didn't make me hungry enough) and this time she shared a protein-packed way to start the day with her Refried Black Beans. We often start our day with a side of beans in my house...and I think a scoop of these would put a smile on my family's faces. 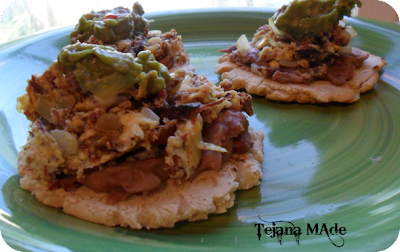 Another way that I love to start any day is with a plate of Migas. 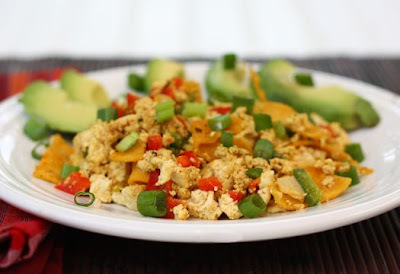 Well, Claire from Chez Cayenne brought a beautiful plate of Tofu Migas to the table this month...and I just KNOW that I NEED to try them for myself. What an awesome recipe to have in your arsenal for your vegan friends and family...or just when the mood strikes! 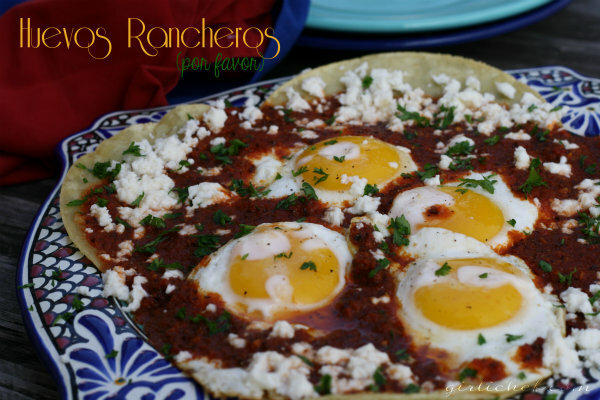 Let's bring this utterly fabulous Mexican (& Mexican-inspired) breakfast buffet to a close with another personal favorite (and a quickie) from my (Heather from girlichef) kitchen, Huevos Rancheros. Tortillas, eggs, your favorite salsa, and some queso fresco. That's pretty much my idea of happiness. Muchas gracias to all of the amazing ladies that helped fill up my breakfast table during the month of August with their amazing dishes. All that's left to do now is fill up my plate! For more information on the Breakfast Club and future installments, please visit Helen at Fuss Free Flavours. Oh my goodness, I shouldn't have looked at this roundup on a fast day. Sweet torture! I can't get enough of Mexican flavors either so the question really is...which one of these to make first! Dangit. Shouldn't have read this while hungry! Whoa.. this is quite the recipe round-up, Heather. I'm not much of a breakfast eater but I would be ready for lunch or dinner any day of the week with these dishes on the menu. I was at a new store that just opened up in our neighbourhood and I was excited to find Mexican chocolate. Now maybe it is only for hot chocolate for breakfast but excitement is in the air. it's times like these that makes me wish i had this whole round up in front of me so i could take a bite of each! forget breakfast! i want some of this for dinner tonight! yum yum yum! I love this because I always put more work than anything into my breakfast. It is the most important and my favourite meal of the day!